Black turtle beans, when very fresh, have a sweet flavor. I don’t know how many readers remember a post I wrote in July 2008 entitled, “How Local Can You Realistically Go?” It was a post about the fact that it is very difficult in most areas of the United States to buy and consume locally produced staple foods such as grains and beans, and how two people here in Athens had set out to do something about it. Visionaries Brandon Jaeger and Michelle Ajamian started out small, using a grant from the USDA’s Sustainable Agriculture Research and Education (SARE) project to research the feasibility of growing staple grains in southeastern Ohio. They started with such crops as amaranth and azuki beans, but later, added black turtle beans, heirloom corn, quinoa and spelt to their agricultural trials. The couple formed THE APPALACHIAN STAPLE FOODS COLLABORATIVE and have created partnerships with Community Food Initiatives, Rural Action and ACEnet here in Athens in order to create a local food system that includes staple grains, beans and hopefully, in the future, oil seeds crops. This year, they also created The Shagbark Seed and Mill Company, in order to distribute their locally grown and processed staple products here in our region. They are selling their whole kernel heirloom corn, split and whole black turtle beans, whole spelt berries, and freshly stone ground corn and spelt flours at the Athens Farmer’s Market as well as at local outlets such as The Village Bakery, Fluff and The Farmacy. Having used most of their products recently, I am happy to report that they are all of very high quality–flavorful and very fresh. The spelt flour makes delicious pancakes (look for a recipe for them in the near future), the corn flour makes lovely cornbread, and the spelt berries cook up chewy and delicious and this year, replaced the wild rice I have been using for years in my Thanksgiving Four Directions Dressing. And the spelt was much tastier than the wild rice and will be used from now on. 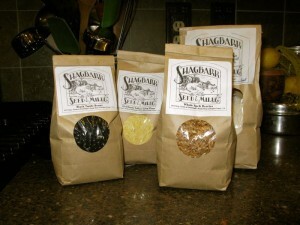 But my favorite of their products so far are Shagbark’s black turtle beans. Dried beans that were grown locally and harvested this year have a fuller, sweeter flavor than the ones which have been sitting on a shelf in a grocery store or warehouse for who knows how many umpteen years. They also cook slightly faster–not much faster–and I found that the variety that they grew had slightly firmer skins than I was used to, which means that even when they are fully cooked, they have a tiny bit of chew to them. The insides are creamy and soft, but because the skins are slightly tougher than I am used to in black beans, they never turn into mush! I cooked them in a very simple way–with the Appalachian staple of a ham hock, along with various aromatics and seasonings–and they turned out divine. Simply and utterly divine. Kat and Zak fell in love with them, and both of them ate a huge amount of them the night before Thanksgiving. 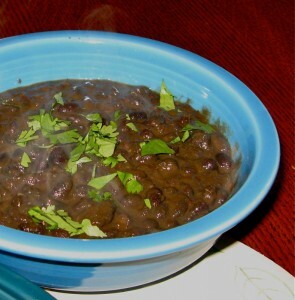 So, here, I offer my recipe for black turtle beans–you don’t have to use Shagbark’s beans to make this dish, but if you can get them, I urge you to try them and see if I am not right about their superior flavor and texture to the usual grocery store dried beans. Heat olive oil in a heavy-bottomed pot or pressure cooker. Saute onions, peppers and bay leaves until onions are dark golden in color. Add ham hock, garlic and dried thyme and continue cooking, stirring often, until the onions are reddish brown, the ham hock has taken on color and everything is fragrant. Add the rest of the spices, the vegetable broth and the beans. Bring the beans to a boil, and if using a regular pot, turn down and simmer for two hours or so, stirring as needed, until they are tender. If using a pressure cooker, lock the lid on the cooker, bring pressure up to full, ease the fire under the beans to low, and cook for about twenty minutes. Quick release the pressure and make sure the beans are done. If they are still a tiny bit underdone, just simmer with the cooker open for about ten minutes, or until the beans tenderize completely. Add salt and pepper to taste and garnish the beans with a sprinkle of cilantro just before serving. I am so happy to see a new post from you today. Happy Thanksgiving, indeed! Dried beans came up at the end of the season potluck for our CSA through Grow Youngstown. We were asked if there was anything during the season that we had wanted but had not received and many of us would have liked to have had some local beans. Thanks so much for the review and recipe. I’d like to stay and chat, but I’ve got to run out to the kitchen to soak some beans. Hi there and thanks for trying our beans! It’s great to know our beans and other products are being tried by writers like yourself. I’d like to encourage Julie from the Grow Youngstown CSA to get in touch with us to discuss the feasibility of getting our dry beans into her CSA. Of course, anyone is welcome to come on down to Athens, as a few from Columbus already do, to pick up our beans, flour and whole grain directly. Just give us a call at 740-590-8240. By the way, we are about to bring 1200 lb. of black beans to Columbus to Luna Burger (http://www.lunaburger.com), so if you like black bean burgers and like local beans, these are the burgers to buy (did I say they are absolutely delicious?). Call us and ask us about Spelt! Ohio grows the most, it’s higher in protein, lower in gluten, and has more fiber than wheat. I’m going to write a couple more posts about your products–especially the spelt berries. They taste so GOOD! The whole spelt I had before was kinda–oh, cardboardy tasting. Maybe it wasn’t as fresh as yours? I bet that was it. But the spelt berries y’all grow are delicious, and I am working on developing some recipes using them. Also, I told Brandon this the last time I saw him at the Farmer’s Market, but your spelt flour makes the best pancakes. I replaced all of the whole wheat flour in my usual recipe and 3/4 of the all purpose flour–and the flavor of the pancakes was amazing, and they still rose up light and fluffy. I’ll be posting that new recipe, too. Any chance you guys will bring us any other beans? Because I LOVE beans. And lentils…..